In 1884, Germany colonized the northeastern part of New Guinea including the island of New Britain. Shortly after the outbreak of war in 1914, the Australian Naval and Military Expeditionary Force was formed and landed at Rabaul on 17 September 1914. The Germans quickly surrendered. The Australians suffered light losses although the Australian submarine HMAS AE1 disappeared with all hands off New Britain on 14 September. After the war, Australia was given a League of Nations mandate to govern New Guinea. 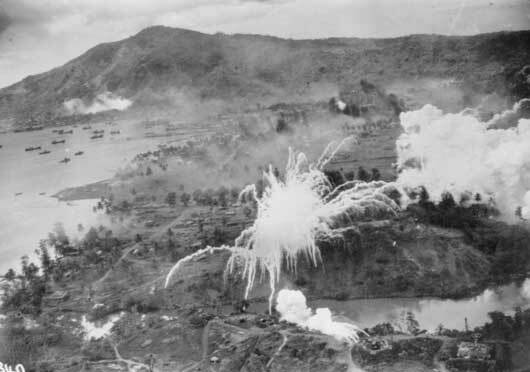 Rabaul, the peacetime capital of the Australian Mandated Territory of New Guinea, fell to the Japanese on 23 January 1942. The small Australian garrison, Lark Force, was overwhelmed and most of its troops, including six army nurses, captured. Approximately 400 of the troops escaped to the mainland and another 160 were massacred at Tol Plantation. In July 1942, about 1000 of the captured Australian men, including civilian internees, were drowned when the Japanese transport ship Montevideo Maru was sunk by an American submarine off the Philippines coast en route to Japan. Only the officers and nurses, sent to Japan on a different ship, survived. Rabaul was developed by the Japanese as their main naval base for the Solomon Islands and New Guinea campaigns. Allied strategy for the South West Pacific Area, Operation Cartwheel, aimed to isolate Rabaul and reduce it by air raids. In December 1943, US Marines landed in New Britain and were soon replaced by US Army troops who were relieved by the 5th Australian Division in late 1944. The Australian established a base at Jacquinot Bay and in early 1945 cleared the Japanese from the western end of the island pushing the Japanese into the Gazelle peninsula with the 5th Division firmly established across the narrow neck of the peninsula between Wide and Open Bays. This line remained quite until Japan surrendered in August 1945. 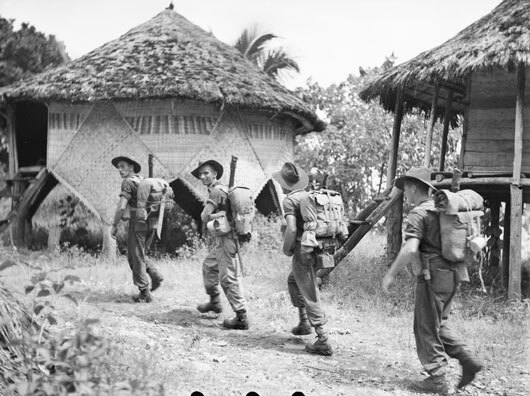 Men of A Company, 14/32nd Infantry Battalion entering Kalampun village (AWM 078376). Private H.J. 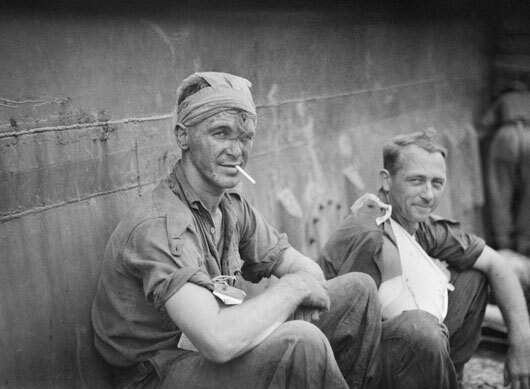 Adams and Lieutenant A.G. Mawson awaiting evacuation with other members of the 14/32nd Infantry Battalion (AWM 079861). 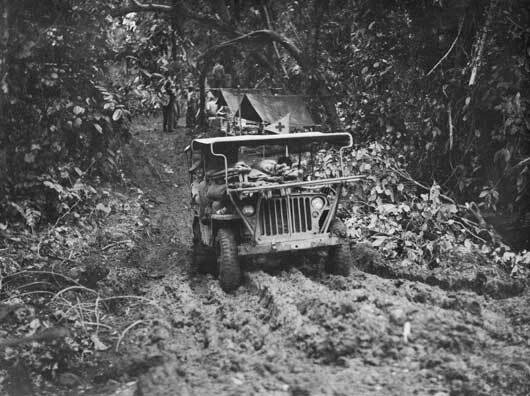 A Jeep ambulance assisting in the evacuation of wounded personnel of the 14/32nd Infantry Battalion from Rabaul (AWM 079862). 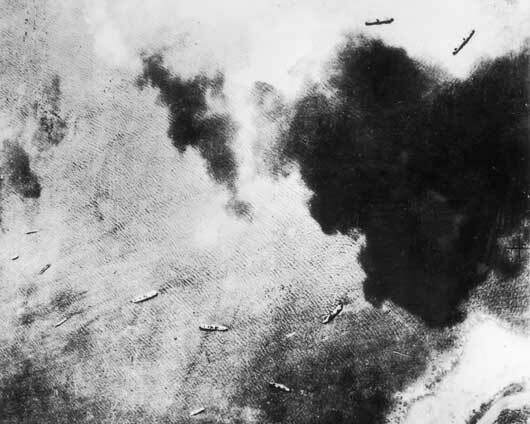 An aerial photograph of bombing raids on Japanese shipping in Simpson Harbour, Rabaul (AWM 101146). The reconnaissance of Truk by a specially fitted Hudson Mk IV of 6 Squadron RAAF (AWM 128121). 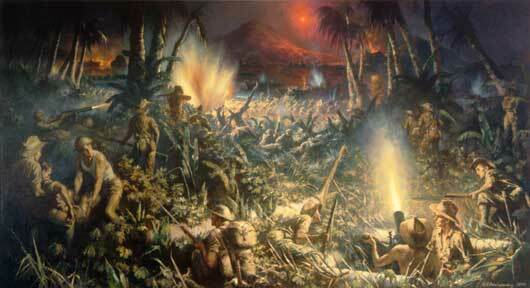 Geoffrey Mainwaring, "Japanese landing near Vulcan, Rabaul" (AWM ART27632). 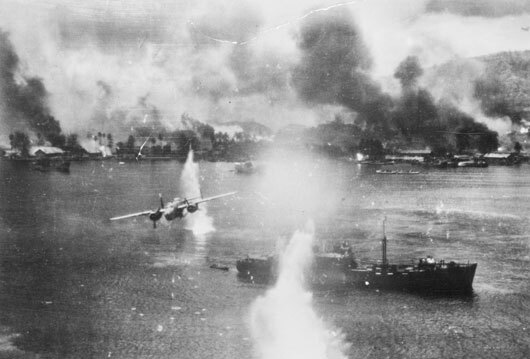 Allied air forces striking Japanese shipping in the harbour at Rabaul (AWM P00240.024).